We recently held commencement for the graduates of the Bolivar High School Class of 2018. I always like to provide a few words of encouragement for the graduates. 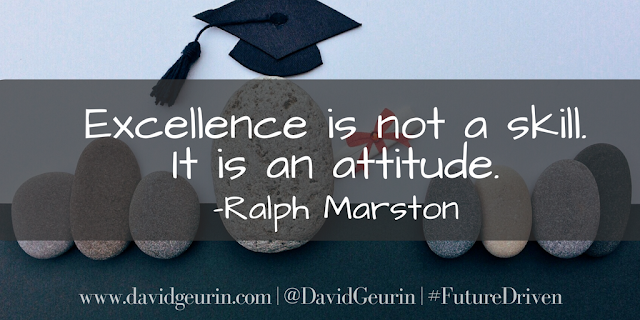 The overall theme of my message this year was Aiming for Excellence. 1. What’s your purpose? What is your purpose? Or another way of saying it, what is your dream? I believe every person has a specific purpose. There’s a dream in your heart to do something great. Find out what that is. You have a gift. Your voice matters. You were born to make an impact. Find your purpose. Think deeply about this. 2. What will I do today to move in the direction of my dreams? How will I carry out my purpose? Dreams without actions will always just be dreams, but if you put your dreams in motion and pursue them with passion, there’s nothing you can’t do. And you’ll leave the world a little better than you found it. A couple of years ago, I stopped at Walmart to pick up a few things. I was eager to get home after a long day, and the checkouts were backed up. You all can probably relate to that quick trip into Walmart. Never happens. I randomly picked a line since they were all busy. But this time I picked the right one. Before I knew it I was on my way home. That line moved so fast. It was clear the person working this checkout was doing a great job, not just putting in her time. She looked up and said, "I love my job." I love my job. I...Love...My...Job!!! That’s what she said. And I thought to myself that’s pretty cool, maybe I need to try for a job at Walmart. But seriously, it’s not every day you hear someone say that. Lots of places I go people seem miserable in their jobs. You probably see these people too, dragging themselves along with a frown on their face. But not this Walmart cashier. She was going above and beyond. She went on to double bag all my cold items, rushed around to help load groceries into the cart, and even made a suggestion about a type of potato chips our family might like similar to the ones I bought. She wasn’t just doing her job. She was aiming for excellence. What’s your purpose? What will you do today to move in the direction of your dreams? In everything you do, give it your very best. Do more than expected. Be generous in how you treat others. Be faithful in the small things, and you’ll have opportunities to do greater things. Whatever you do, do it with all your heart. Be the best version of you. More than your talent, your education, or what’s happened in your life to this point, the thing that will determine your success and your future more than anything else is your attitude. Most people tend to see the negative. But did you know that in a study of the best characteristics of leaders, the number one thing people want in a leader is a positive attitude? Not everything that happens to you will be positive. Life will knock you down. There’ll be obstacles, failures, and disappointments that come your way. When these things happen, get back up. You’ll be a stronger person. When (BHS cross country athlete) Kelie Henderson fell to the ground with the state championship right in front of her (she had a sizable lead at the time), just steps from the finish line, she didn’t quit. In the end, she didn’t win the race, but she showed she’s a winner. Her body shut down on her. But her spirit pushed through, and she crawled the last hundred yards to the finish line. And she inspired us all. I know many of your stories. Some I do not, regretfully. But I know all of you have faced challenges. Sometimes getting out of bed in the morning felt like a challenge. But you are overcomers. There will be difficulties. But in difficulties there are also opportunities. View your challenges as beneficial. I’ve learned nothing in my life from the easy days. The easy stuff teaches me nothing. But the difficulties, the hardships, and even the pain has taught me so much. #1 Start With Questions - What is your purpose? What will you do today to move in the direction of your dreams? #2 Aim for Excellence - Whatever you do, do it to the best of your ability. #3 Lead Up - Your positive attitude, more than your talent or expertise, will determine your success. #4. Lift Up - Be generous with people. Give encouragement and understanding. #5 Never Give Up - Your struggle will make you stronger. Everything that happens is an opportunity to learn and grow. Never give up. It’s the Bolivar Way. Class of 2018, I am very proud of you and your accomplishments and it’s been truly an honor to know you and be a part of your high school years. I wish you the best. I believe in you. God bless you all!